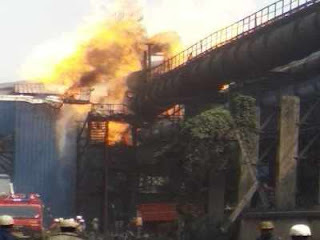 Again On Friday afternoon in the chattisgarh located Bhilai Steel plant, the accident happened. In this accident, 7 employees and 1 contractor have been injured as of now, three of whom are said to be in critical condition. All the injured have been admitted for treatment in the Pandit Jawaharlal Nehru Medical Research Center, Sector 9.
according to information received from sources, In morning about 9 am, furnaces of steel melting shop 1 of steel plant was blast 3 times with in 30 minutes. Now, forces successfully controlled situations. we have to wait for full reports by actual sources.